Can you believe it is almost April? 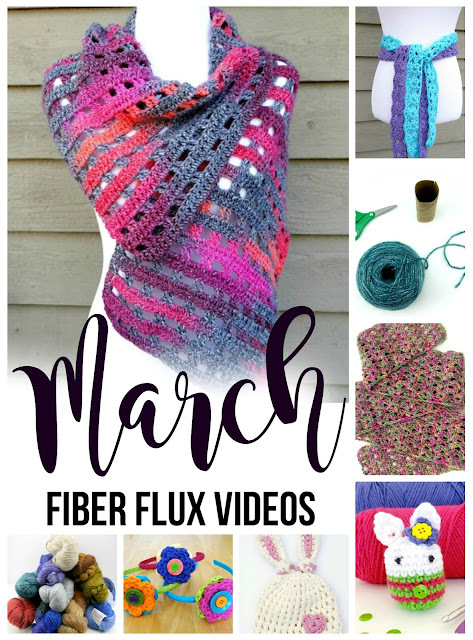 Here's what we did in March on the Fiber Flux YouTube channel...so much stitchy fun! In case you missed any of the videos as they were released, here's another opportunity to learn something new or help you with a project. Thanks for watching and if you have an idea or suggestion for a new video you haven't seen yet on Fiber Flux, be sure to comment below! First up are the Button Flower Headbands...cute, fun and super easy to make! This Easy Lace Belt will add a little handmade goodness to any outfit. This sweet little Newborn Bunny Knot Hat would look so precious on a little one! Mrs. Bunny Cottontail is quick to work up and a great way to use yarn leftovers too! The Tulip Tree Scarf is elegant, lacy and perfect for a special skein of yarn! Ever wondered how to wind a center pull ball of yarn by hand? Learn how with this easy tutorial...no fancy tools needed! Our latest feature yarn in the Yarn 101 series is Venice from SKEINO. Learn about all of the lovely colors and the unique way it is made. The Heathered Eyelets Wrap is a fabulous wrap crocheted with luxurious yarn with a simple eyelet stitch. Recently found you via pinterest and made the Heathered eyelets wrap and am in love! I am at home recovering from a stem cell transplant and chemotherapy so crocheting is perfect for me right now! Thanks so much!